It used to be that as you drove from one side of the state to the other, you passed hospitals with five-fold variation in the quality, safety, and process of care and cost effectiveness. After years of studying this variation, researchers and surgeons in Washington State decided to roll up their sleeves and do something about it. Their response was the creation of the Surgical Care and Outcomes Assessment Program (SCOAP), a state-wide, performance surveillance program targeting surgical quality improvement (www.scoap.org). The purpose of SCOAP is to improve the safety, quality, efficiency and appropriateness of surgical care across statewide hospitals by applying an aviation-like monitoring and response system. Process of care and outcomes data are gathered prospectively from hospitals, risk-adjusted, and returned to surgeons so they can find out how they measure up and where there are opportunities for improvement. SCOAP couples data feedback with active interventions like standardized order sets, educational forums, and a statewide SCOAP surgical checklist, a tool that directs behavior change of OR teams to address SCOAP metrics at the point of care. Washington State just became the first state ever to celebrate SCOAP surgical checklist adoption in every hospital, a project completed within just one year and the product of hard work from a broad coalition of stakeholders (www.scoapchecklist.org). SCOAP was created in 2005 as a 5 hospital pilot program and expanded in 2008 through a grant from the State of Washington’s Life Sciences Discovery Fund. SCOAP is now at 55 of 60 SCOAP-eligible Washington State hospitals and has moved beyond general surgery to include pediatric surgery, vascular surgery, interventional radiology, and bariatric surgery, with developing modules in urology, spine and ambulatory surgery. The creator and current Medical Director of SCOAP is Dr. David Flum. 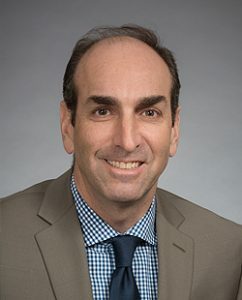 The administrative home for SCOAP is the non-profit Foundation for Health Care Quality and research and development work for SCOAP is performed at the Department of Surgery’s Surgical Outcomes Research Center (SORCE). SCOAP is governed by a surgeon-led management committee including the leadership of the state chapter of the American College of Surgeon. SCOAP connects a community of surgeons and taps into the grassroots energy of surgeons working together to “own” surgical quality in Washington state. In this way we are creating our own version of healthcare reform that keeps the patient central and builds a surveillance and response system that allows surgeons to take ownership of variability in outcomes, cost, and appropriateness of care. As the challenges of improving healthcare become more complex (cost containment, controlling the inappropriate use of technology, coverage issues), having the active voice of clinicians united in a community is central to real reform. SCOAP is increasingly viewed by stakeholders as an exemplary approach to improving health care while containing costs. The program has received support from Governor Christine Gregoire, the state’s congressional leaders and the Washington State Business Roundtable. We expect SCOAP’s influence to grow even stronger as experiments in payment reform for quality become more dependent on clinical communities working together. SCOAP is working: SCOAP hospitals have fewer complications, more efficient care delivery, and shorter lengths of stay than non-SCOAP hospitals. Modeling the program’s impact on healthcare resources during its first 4 years, health economists calculated that SCOAP hospitals saved the system over $50 million. These cost differences are the results of surgeons reducing rates of costly and high impact complications by using best practices. 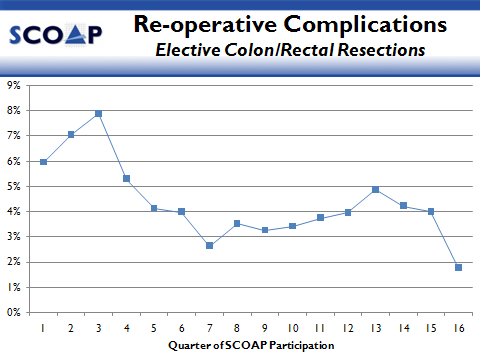 As example, the figure below demonstrates the sustained reduction in the rate of re-operative complications for elective colon resections in SCOAP hospitals on a quarter-by-quarter basis. SCOAP is our state’s system for safer surgery. It rests on the simple principals that knowledge is power; that knowing how we did last month will improve how we do in the OR today and that surgeon engagement is the only way to really drive healthcare reform. In every corner of our state and for all of our neighbors, SCOAP’s example of translating research on quality to real quality improvement is something we can all be proud of.